Security always the very big issues for all webmasters especially for biggest business websites. They spend a huge of money to their protection and safer their websites from hackers as much as they can. 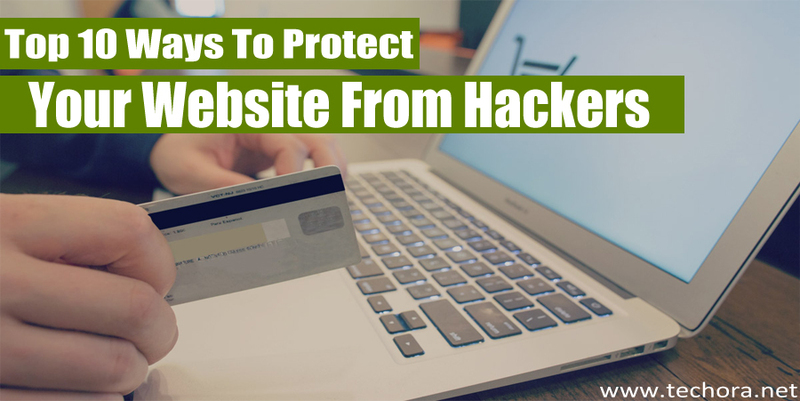 If you want to make your websites and blogs safe and protected from any other like hackers, spammers then follow these tips and protected your business websites from them. Hacking is a very dangerous type of security risk which is harmed any one on any place in the world. Hacking is a regularly performed risky automated scripts which is used through the internet and attempt to exploit the well known websites security. In my previous article, I’ll share how to secure your social media accounts from hackers. Now below I’ll mention 10 security tips that helps you to keep safe your websites from hackers and run your site safely online. This is very first way which is very easy to utilize because it is done easily. Backup your websites is very first step and very important. When you trying to change any of your website, first of all keep backup of it into your computer hard drives and then keep change on it. Because if any error occurs during changing your site, you can easily recover it via backup file. You can do this process manually or use any available plugins in the market. If you use a WordPress site then there are many alternatives to backing up your database easily and free of cost. Always update your website on daily basis. If any hacking threats found, you always stay up to date. If you know very basic knowledge about these threats then you can easily remove them and safe your website. So always use different techniques and methods to keep your website up to date.Also update the necessary software’s and plugins that might be helpful for you. The admin access control level of any website is an easy way to change your websites and you can doing different security stuffs that hacked don’t see. Always try to enforce your user names and passwords that cannot be guessed easily. Change the default database prefix which is almost “wp6_” to something harder and not easy to guess. Also adding the limit of total login attempts and setting the certain time period. Never send any type of email, password, or any other information to anyone because if you can do so, any unauthorized person will gain access to your account and hacked it. Google Webmaster Tools is a free online tools provided by Google to all webmasters to manage their websites in a single account. There are thousands of hacked sites are not added in Google Webmaster Tools because they don’t gets any kind of hacking threats so their websites hacked. If you added your site into Google Webmaster Tools, then your website hacking chances decreases and you can keep safe your site against these threats and from hackers. Always enable the google alerts that keep to safe your site against hackers. It your website starts associating with the unrelated queries then it’s time to starting the investigating for 3rd party attacks. So always try to set up Google Alerts on to ensure your site isn’t associated with that kind of unrelated queries which are harmful for you and your website. If you’ve a WordPress site, then there are many issues by default found, like directory browsing. It is not a good idea to allow your readers to browse your website directory. Because this is an easy way to find out about the structures of your website directory and this makes more easier for hackers to lookup your security issues and doing some harmful stuffs. So you can simply adding this piece of code into your WordPress .htaccess file which is exist into your root directory of your WordPress site. This helps you to disable directory browsing and no one will directly access to your website directory. If you’ve a big organizational and company based websites then make sure that any computer users in your office may be not easily access to your network. You can adding login expires after a short period of time and inactivity,always changed your passwords on daily or weekly basis or when required, never written your password on anywhere and makes it stronger as much as you’ve. First scanned all devices and software which are used in a network, especially whenever you try to attached into your network again. The important technique to prevent your website from being hacked simply install the web application firewall. It is just kind of both hardware or software. It can be set in between your data connection and your web servers and reading each and every bits of data travel from them. Hackers used many different and latest technologies and malicious bots, spammers softwares etc, so this is the great way to avoid getting hacked your site. SSL (Secure Socket Layer) protocol is an encrypted protocol used to transfer users personal information between your site and your site database. If you use SSL protocol, then it prevent the primary information being read in transit and don’t access any unauthorized person to that file without a any proper authorization. So these are the 10 best security tips to keep safe your website from hackers and spammers. Make sure you’ve follow all these points properly. If you find out anything missing in this article then share below. Also share this guide with other fellows just for the spreading knowledge.